Anything that can be brailled can be represented on the CAL-tacTM Braille Caravan! Learn to read, write, and play games with the CAL-tacTM Braille Caravan. 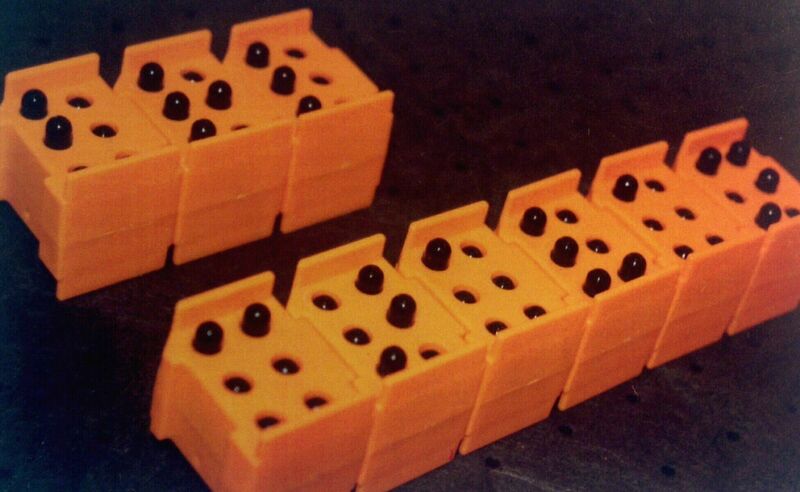 Each goldenrod-colored block of the caravan represents a braille cell, with six contrasting black pegs that glide up or down to form dots 1-6. They are made in the USA of high density non-toxic plastic. The new and improved second generation CAL-tacTM Braille Caravan uses the power of magnets to stay in place. Use your finger, stylus, or any pointed probe to push the peg forward from the underside of the block, just as you would write with a slate. Flip the block over and read what you wrote. Blocks interlock to form a caravan of words, numbers, or sentences. Play (practice) alone or with a blind or sighted partner. Build, challenge, and hone tactile reading, writing, and spelling skills and much more. Each set includes 15 CAL-tacTM Braille Caravan (2nd Generation) blocks, an Activity Guide, a non-skid mat, and a carrying bag.